It was Persolaise’s review of the latest Aqua Allegoria; Lys Soleia, that led me to seeking out the Aqua Allegoria line, and I’m very glad that I did. My interest in the line, and Pamplelune specifically, was further piqued by Birgit of Olfactoria’s Travels who had written that she was a big fan of Pamplelune but other people’s reactions prevented her from wearing it. Well after that I simply had to try it, and try it I did. 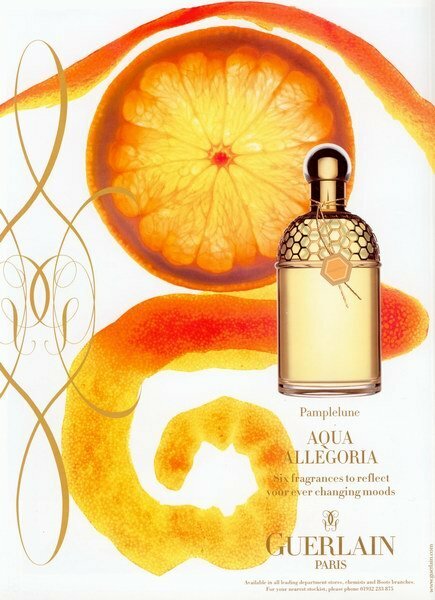 Pamplelune was part of the original crop of Aqua Allegoria’s released in 1999, a collection inspired by nature and intended to be more accessible to the younger Guerlain consumer. Available in a lighter concentration (EDT) and at a lower price point than the regular Guerlains, the Aqua Allegoria’s still manage to showcase fantastic ingredients, both natural and synthetic, to create perfumes that feel like non-ephemeral interpretations of nature for the skin. One sniff of Pampelune and all my grapefruit-based fears are blown away. Pamplelune is the smell of a freshly squeezed grapefruit in all of its tart, bitter and sweet glory. There is nothing dire or synthetic-smelling about it, quite the contrary, the grapefruit in Pamplelune’s opening is full, brightly coloured, dripping in dew and heavily sulphurous. It is as close to the real thing as one can get. The grapefruit is ever-present throughout Pamplelune’s development and is juxtaposed against a strong, earthy patchouli note that gives it a sparkling, effervescent quality as well as a touch of dirt and camphor. It takes complexity to make this kind of simplicity and the inner workings of Pamplelune, the small shifts from grapefruit to patchouli like the intricate workings of a clock, tick along so smoothly one hardly notices the changes. Rich, green and pollen-stained white flowers occupy Pamplelune’s heart and lead one to think of the garden in which these beautiful grapefruits are growing. The base is an even richer affair, laying the grapefruit, flowers and patchouli over a bed of vanilla-scented earth that is dusky, sweet and glorious in absolutely every way, shape and form. Sometimes the simplest smelling scents are the best and Pamplelune really is quite something. It certainly is enough to lead me to rethink my opinion of grapefruit, well the smell at least, you’ll never catch me actually eating one, I’m not a sadist. I can really see it being my go-to citrus scent this summer when the muggy weather really hits. It will refresh me and I will love it. Pamplelune is available in 75ml and 125ml Eau de Toilette with prices starting at £33. Notes vía basenotes.net. All qoutes via guerlain.com. Image 1 thescentsofself.com. Image 2 cagrapefruitforhealth.com. Posted in Citrus, Floral, Fruity, Guerlain, Perfume Reviews, Unisex and tagged Aqua Allegoria, Grapefruit, Guerlain, Pamplelune, Patchouli, Perfume. Bookmark the permalink. I’m glad you tried Pamplelune and ended up loving it, it is a classic! I too have completely ignored the ‘Pamplelune’ & equally detest the usually far too urinous grapefruit notes usually around. (And to me most do come across especially ‘pissy’ unfortunately.) – So rather than smell ‘those ones’ I’d much rather eat it, thank you very much. So yeah I have ignored it obstinately. Now if they did a ‘Tangerinelune’ I would be all over it like a shot. 🙂 – From the way you have described it’s development & notes, I’d have loved to see a Tangerine>patchouli>vanilla alternative. Now that to me would be truly mouthwateringly scrumptious. Still, now that you have been so pleasantly convinced, I think I too should finally try giving it a tentative sniff – who knows I too might discover the joys of the ‘Pample-moon’. ~ (I certainly am in need of a summer refresher frag, that’s for sure ! I would also like a Tangerinelune, but wonder whether Mandarine Basilic would fit the bill? Do try Pampelune, it really is beautiful! You know, (& sorry for the unnecessary pedantics) but, just about most everyone talks about mandarin & tangerine as being interchangeable, practically the same. However I must strongly. To me they not only taste different, but more importantly smell distinctly different too. Yes they’re similar-ish, but definitely NOT the same. (To my nose Tangerine is to Mandarin as Lime is to Lemon, for example). Seeing as one variety’s grown in Asia/China (Citrus reticulata), whilst tangerines (Citrus r. tangerina) are from Africa (i.e. Tangiers, duh ;), it shouldn’t come as a surprise they’d vary somewhat surely !? ~ M.Micallef uses lovely true tangerine notes, (best I’ve smelled yet. – Seems she favors them too.) Especially so in her frag ‘ETE’. (Opens with a deliciously juicy Tangerine (‘green’ in this case) , but then (ironically ?) unfolds more mandarin as it progresses. She uses both notes in ETE. I’ve actually not given Mandarine Basilic a ‘nose-in’ or fair chance yet, expecting it to disappoint. (Finding the Green-Tea & Basil combo a bit scary too.) – But I’m thinking now maybe I should. Perhaps Guerlain have in fact used a true Tangerine note here after all, yet the French too might insist on just lumping it all under one ‘mandarine’ banner ?? – Certainly possible ! – So THANX for placing it back in my radar ! Well of course they’re not the same but they are similar and perhaps MB would be as close to the real thing you could get? I don’t know, my experience with it is limited. Oops typo. … 3rd line is missing a word. It’s meant to read : “However I most strongly [disagree] ” … “disagree” is missing. I’m glad you agree. … Yes I’ve been on the great tangy tangerine hunt for ages now. I finally thought maybe Miller Harris’ ‘Tangerine Vert’ would be it. But for some reason it failed to capture me as I expected (??) – I think perhaps I need it to be more ‘photorealisticly, mouthwateringly juicy/ripe (& slightly sweeter too) to hit my tangerine sweet-spot. Yes I’m afraid I totally agree. ~ Out of her entire oeuvre there’s only one that I’d possibly wear ( & that’s if someone gave it to me), and that’s her latest one La Fumée, which I think is quite pleasant. – IMO it’s her best effort. Yay, I’m glad to see you’re with me on the grapefruit front! You should definitely re-test Pamplelune, it’s perfect for this muggy weather. I was pleasantly surprised by this when I sniffed it on my brother a while ago, though I must say I chickened out from spraying it on myself, also being a grapefruit phobe. And it really wasn’t half bad. And yes, my brother would love a Tangerinelune fragrance – he owns most of the perfumes you can buy with “tangerine” in the name! Right, we need to start a Tangerinelune for Guerlain campaign. Let’s make some pitch boards. I can go for a tangerine Guerlain, definitely. Let’s tell Thierry Wasser to make us a Tangerine AA next summer. Though I insist it’s a summer frag, not a winter one. I want crisp citrus sparkle, not rich winter citrus and spice potpourri. And definitely not an orange fragrance. Somehow oranges just don’t do it for me at all in perfume. 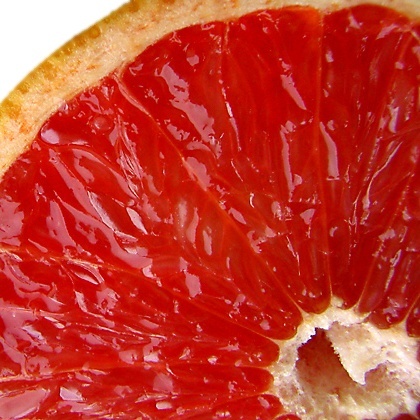 Grapefruit though… now you’re talking. In fact, I even owned a bottle of Pampelune before I became perfume-obsessed. I’ve always been a fan of classic citrus eaux de cologne and this AA fits in alongside those as a clean, fizzy, zesty scent that perks you up on muggy days. I’ve even been known to spritz it on in the morning in an attempt to persuade my eyes to open. We do love a bit of perversion here! Right, we need to start this Guerlain tangerine campaign, I want you all to me outside No 8 Champs Elysees with protest boards, tangerines and a megaphone! The body odour note seems to be widely reported and until yesterday I didn’t really notice it but when I was walking to my car outside work I caught a whiff of something sour and quite funky. It definitely caught me by surprise! Grapefruits taste so good! Are you sure you tried a good, ripe one, properly peeled? My mouth is watering as I’m typing this. Pampelune smells very good. It’s not a perfume to love but it’s definitely a perfume to wear. I agree with Jules that mandarins and tangerins smell and taste completely differently but I personally prefer mandarins. And I love the florals in this. Thankfully, I don’t get much patchouli (blergh). Ooh, I’ve never tried it with sugar! Does it really make a difference? Ah… love your description of the notes. This is the 2nd Guerlain I ever bought (after Shalimar). I also get that “sweet dirt” note, and find that actually gives Pamplelune a good solid base and a longevity that other citruses seem to sorely lack. Regarding its online haters, I find it strangely annoying when one person says “cat piss” and a thousand unimaginative individuals latch on to that phrase as the ONLY way to describe that sharp, bitter ammonia-like edge that makes Pamplelune one of the most glorious and dimensional grapefruit scents in the world. On a strange side-note, it’s probably sacrilege to some people, but I like to mix Pamplelune, Marc Jacobs Lemon Splash, L’occitane Citrus Verbena, AND Fresh Brown Sugar into a small decant so I spritz myself with the mother of all citrus-bombs. It’s mouthwateringly-juicy, cottony, sharp, herbal, bitter, caramelized, AND earthy all at the same time. I agree, it’s that weird dirty patchouli that really cements the citrus and gives it the strength and longevity that make it so wonderful. Your little concoction certainly sounds lovely! This is breakfast, lunch and dinner to me. First thing after a shower, an extra hit of freshness. Meeting for lunch, shopping or saving the world a light veil misted just before ups all the accords, paticularly that hint of white floral, which does not offend. And in the evening, who could resist Shalimar laced with Pamplelune, C’est Magnifique! Shalimar laced with Pamplelune?! You have me intrigued Sharonshriver, I must try that!